This wasn’t the first time the world has breached the symbolic climate change threshold—that honour was reached by the northern hemisphere in 2013—but it was a first for the south. Behind these recent findings is a history of Australia’s role in global scientific advancement. The Cape Grim station has now been running for 40 years and the resulting dataset chronicles the major changes in our global atmosphere. 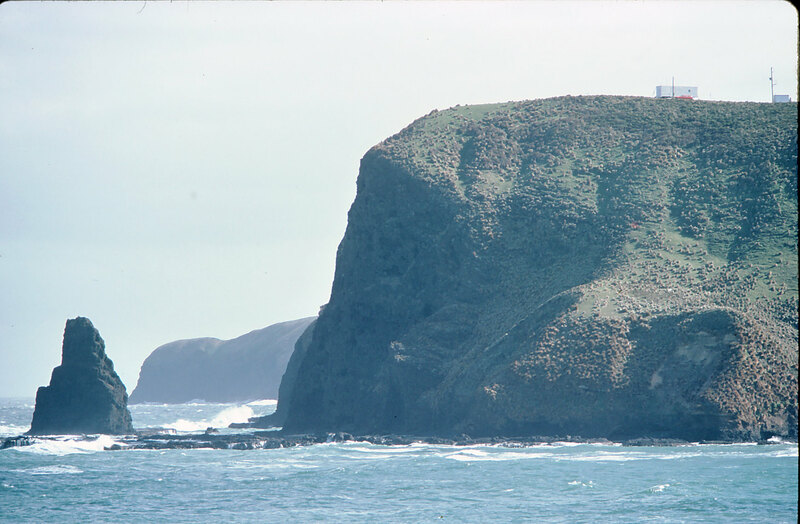 In 1798, Matthew Flinders’ encounter with Cape Grim confirmed to Europeans that Tasmania (then Van Diemen’s Land) was separated from the mainland of Australia. Fast forward to the early 1970s and a small group of innovative scientists were hatching a plan to take advantage of Cape Grim’s isolation and unique geographical position. The site soon became one of the world’s most significant atmospheric measurement sites, meticulously measuring and recording some of the cleanest air that can be accessed on the planet. There were two threads to the beginnings of Cape Grim. One was the young scientists at CSIRO, keen to pioneer an emerging field of science. The second was a call from the United Nations for global governments to work together to set up a network of monitoring stations. The Australian response was championed by Bill Priestley and Bill Gibbs, the respective senior climate figureheads at CSIRO and the Bureau of Meteorology. The scientific community decided that Cape Grim was the most appropriate site for a permanent monitoring station, thereby establishing in 1976 the Cape Grim Baseline Air Pollution Station. The first set of instruments lived in an ex-NASA caravan. Today the station is managed by the Bureau of Meteorology and housed in a permanent building that features state-of-the-art infrastructure, including a tower fitted with important monitoring equipment. Many of the early pioneering scientists are still actively involved in this research. The first set of air monitoring instruments lived in an ex-NASA caravan. The station, part of the World Meteorological Organization’s Global Atmosphere Watch network, was sited at Cape Grim to take advantage of the 'roaring forties'—the prevailing westerly winds that bring clean air from over the Southern Ocean to the station. Air that arrives at the station from the southwest is classified as 'baseline' air. Having had no recent contact with land, it represents the background atmosphere and is perhaps some of the cleanest in the world. While we focus on this clean air, most of the instruments monitor continuously, regardless of wind direction, and can detect pollution from Melbourne and other parts of Tasmania in certain conditions. The station measures all major and minor greenhouse gases; ozone-depleting chemicals; aerosols (including black carbon or soot); reactive gases including lower-atmosphere ozone, nitrogen oxides and volatile organic compounds; radon (an indicator of changes to the land); solar radiation; the chemical composition of rainwater; mercury; persistent organic pollutants; and finally the weather. 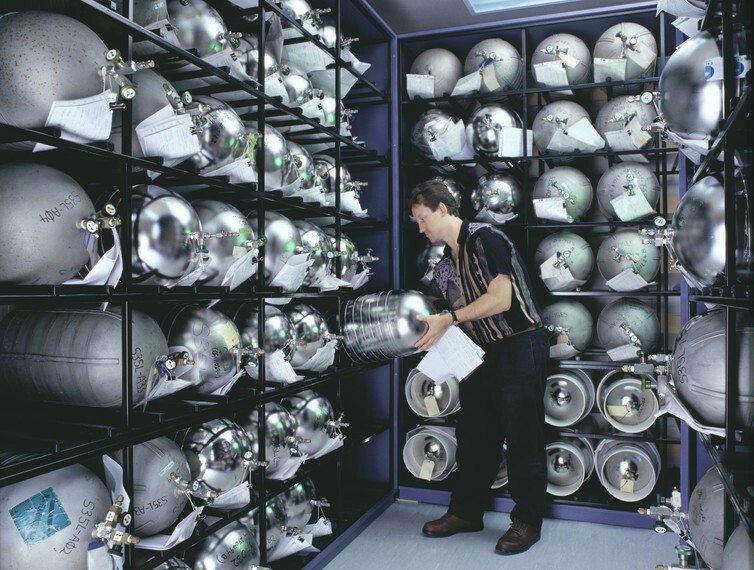 The Cape Grim Air Archive, initiated by CSIRO in 1978 and soon adopted into the operations of the station, is now the world’s most important and unique collection of background atmospheric air samples, underpinning many research papers on global and Australian emissions of greenhouse and ozone depleting gases. 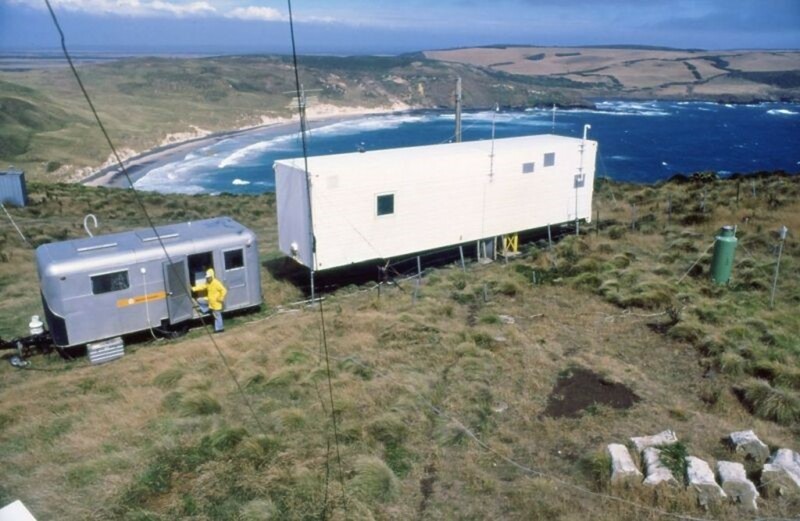 The Cape Grim station maintains an archive of air from the 1970s to today. Cape Grim data are freely available and have been widely used in all five international climate change assessments (1990–2013), all ten international ozone depletion assessments (1985–2014), in four State of the Climate Reports 2010–2016 and in lower-atmosphere ozone assessments. Measurements at Cape Grim have demonstrated the impact of human activity on the atmosphere. For example, CO2 has increased from about 330 parts per million (ppm) in 1976 to more than 400 ppm today, an average increase of 1.9 ppm per year since 1976. Since 2010 the rate has been 2.3 ppm per year. The isotopic ratios of CO2‚ measured at Cape Grim have changed in a way that is consistent with fossil fuels being the source of higher concentrations. 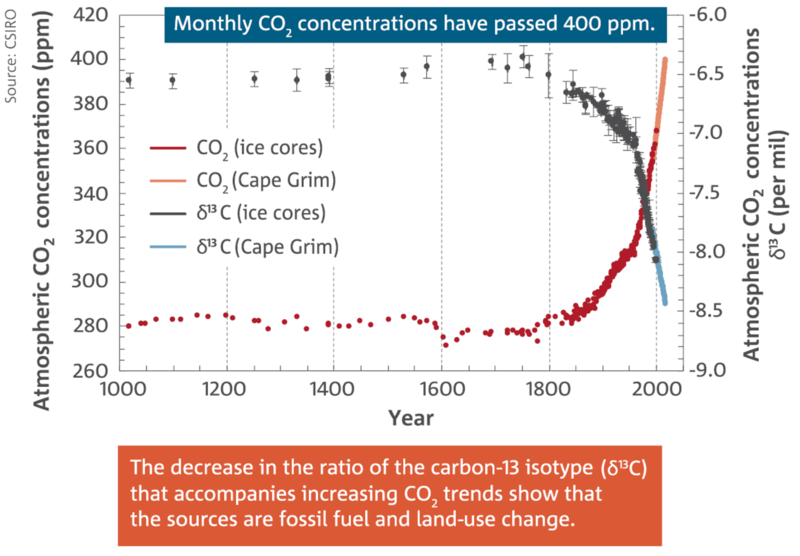 Cape Grim has documented the increase in atmospheric CO2 concentrations. Cape Grim has also demonstrated the effectiveness of action to reduce human impacts. The decline in concentrations of ozone-depleting substances measured at Cape Grim demonstrates the progress of the Montreal Protocol, an international agreement to phase out the use of these chemicals, and leading to the gradual recovery of the ozone hole. Measurements at Cape Grim have contributed significantly to global understanding of marine aerosols, including some of the first evidence that microscopic marine plants (phytoplankton) are a source of gases that play a role in cloud formation. With 70 per cent of the Earth’s surface covered by oceans, aerosols in the marine environment play an important role in the climate system. Cape Grim data are also used by the Australian government to meet international obligations. For example, the station’s greenhouse gas data have independently verified parts of Australia’s National Greenhouse Gas Inventory, which reports Australia’s annual emissions to the United Nations Framework Convention on Climate Change. Persistent organic pollutants have been reported to the Stockholm Convention on these chemicals and Cape Grim mercury data will be reported to the Minimata Convention. Data collected from the Cape Grim Station have been used in more than 700 research papers on climate change and atmospheric pollution. By working with universities Cape Grim is a training ground for the next generation of climate scientists.